Argentina skipper Juan Martin Fernandez Lobbe believes that his side will need to dictate possession if they are to pick up a second successive Twickenham scalp of England on Saturday. The Pumas drew a two-Test series with Martin Johnson's men over the summer and collected a famous 25-18 victory on their last visit to the home of English rugby. Fernandez Lobbe will lead from the front as they target a repeat win and the Toulon back-row has been in superb form - alongside England's rejuvenated fly-half Jonny Wilkinson - in France's Top 14. Despite their familiarity Fernandez Lobbe has few trade secrets to offer on the ex-Newcastle pivot, insisting that the Pumas squad are already well aware of his capabilities. Instead he's targeting England's injury-ravaged pack and hoping to dominate the set-piece and breakdown. "I think we all know what to expect from him," he told ESPNScrum. "He's a really good player, he never misses a kick. He's good in defence and he's good running the ball. We need to be ready for him. "Hopefully we can produce quick ball for us and disturb their ball. We need a good scrum and good lineout and need to control the possession." 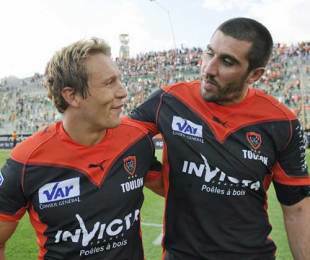 Fernandez Lobbe's sentiments were echoed by his Toulon team-mate Felipe Contepomi, who was originally named as Argentina's tour captain but ruled out due to an ongoing knee injury. "Unfortunately I haven't played yet with Jonny but there's not much to hide about him," said Contepomi, who is hoping to return to action in Toulon's Top 14 meeting with Brive next week. "He's a top quality player, one of the best, if not the best, of our generation. He's in top form; he's fit and playing good rugby. He's confident, and in a good run of games. He's one of those players you always have to have an eye on." Wilkinson's opposite number at Twickenham will be the young Santiago Fernandez, who deputises for the injured Juan Martin Hernandez. Fernandez made his debut against Ireland at Croke Park in the same circumstances last season and both Contepomi and Fernandez Lobbe have full confidence in the 23-year-old, who played both Tests against England in the summer at centre. "We have a lot of injuries," said Contepomi. "Obviously you want to play with the best players every time. That's life. It's about building depth in the team. There are some senior players that won't be on the pitch but it's a chance for young players to experience something unique and to pay at Twickenham. "He's [Fernandez] very confident and a very good player. If he can play the way he plays for his club he'll be great. In front you have England and that's never easy but he'll enjoy the moment." Fernandez Lobbe had a reassuring word for Fernandez, insisting that would be 15 players together on the field come kick off on Saturday. "He's playing at 10, that's a big role," he said. "We're full of confidence in him; he's an amazingly good player and full of skills. We need to believe in him, trust him and all play together."